French automaker Peugeot Citroen has announced it would cut around 8,000 jobs and close an assembly plant, putting the blame on the “profound crisis” in the eurozone market. 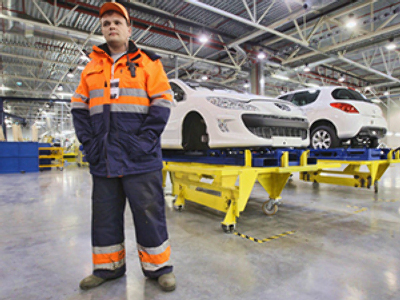 ­“The Aulnay plant near Paris, which employs more than 3,000 workers, will be closed down in 2014 as part of a reorganization of Peugeot's under-used domestic production capacity," the company said on Thursday. The car maker plans to convert the Aulnay site tor other activities and look for new positions for around half its workforce. 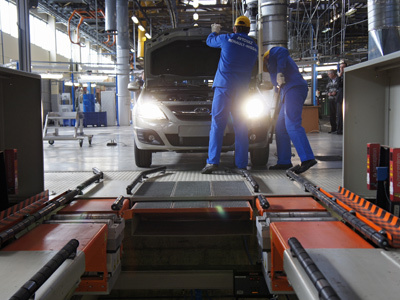 A second factory at Rennes in western France is also being downsized as there is less demand for larger cars such as the Peugeot 508 and Citroen C5. The latest measures are in addition to 6,000 job cuts announced last year, which included 2,500 external positions at subcontractors and service providers. "I am fully aware of the seriousness of today's announcements," Chief Executive Philippe Varin said in a company statement. "The depth and persistence of the crisis impacting our business in Europe have now made this reorganization project indispensable." 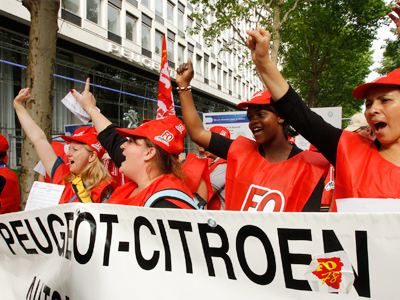 Reacting to the announcement the French Social Affairs Minister Marisol Touraine said the job cuts were "unacceptable" from a company that had benefited from billions of euros in state support to the auto sector in recent years. "We cannot accept something like this," she told Europe 1 radio. A government expert appointed last month to examine Peugeot's finances will report back in two weeks, she said. Peugeot's core auto division saw losses last year and has deteriorated ever since. Unlike Volkswagen, the French automaker is heavily exposed to southern markets worst hit by the region's debt crisis. It also lacks its German rival's export success as well as the support of a low-cost brand like Renault Dacia. Last week Paris-based Peugeot posted a 13 per cent decline in first-half sales to 1.62 million light vehicles- a contrast compared to Renault that reported a modest 3.3 per cent decline. Peugeot’s stock has plunged 32 per cent this year, wiping 1.2 billion euros off the struggling auto maker's market value. General Motors bought a 7 per cent Peugeot stake in March as part of a far-reaching alliance plan announced the previous month. Peugeot also struck a tentative deal with Italy's Fiat on Wednesday. Fiat will sell its half of the plant in northern France to Peugeot by the end of 2012 but keep a share of its production for another four years, under their draft agreement.